Spring, sprung? Here’s the first Pagoda. Perhaps spring will really stick around this time. I did suspect it was soon, I really did; mid-March, and shorts weather? Too good to be true. Blue Diamond Wasabi-SoyAlmonds — or I’ve misremembered that there were two ounces of this. 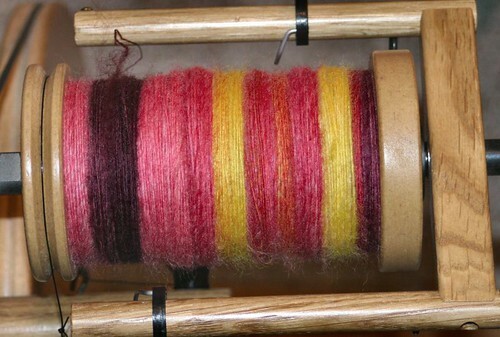 So with that bobbin done, I took the other half of the top to go weigh it, and lo and behold, that half weighed 2 ounces. Seriously, the wasabi almonds are a new kind of crack. I was really dubious about the notion, but got some anyway, and now they’re a staple item from the supermarket runs. 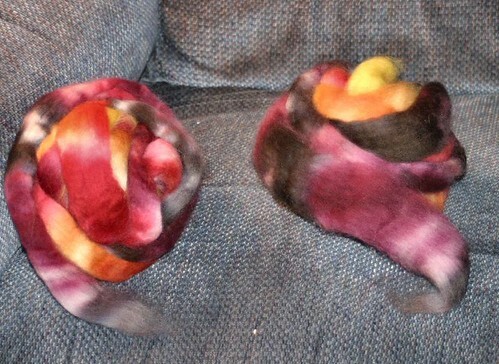 I decided to put the second bobbin off for the coming week, and go ahead and play with some Pagoda. I opted for the Falkland. 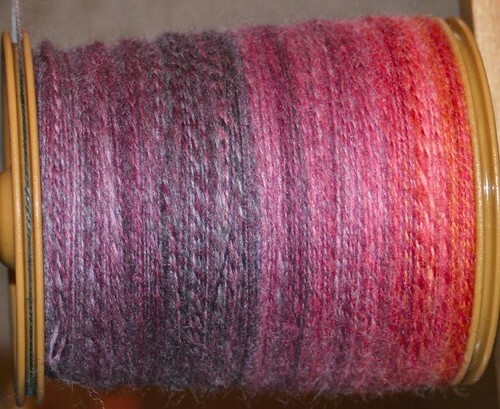 I decided to do this 2-ply, but thicker, you know, like sock weight 2-ply instead of cobweb super-fine, and to split it down the middle so there’d be mostly matching colours with a minimum of barberpole (or marl, depending on your choice of words). See how I’m splitting it, trying to stay in the middle and make sure the two new tops thus created are of equal thickness as I go? Then, I wound it into two balls, starting with the same colour ends, so that what’s coming off the outside of the ball is the same, like you see above. Then I tore off chunks, or tufts, and arrayed them in sequence on the arm of my slothing chair — I’ll start with the ones at the front of the photo. 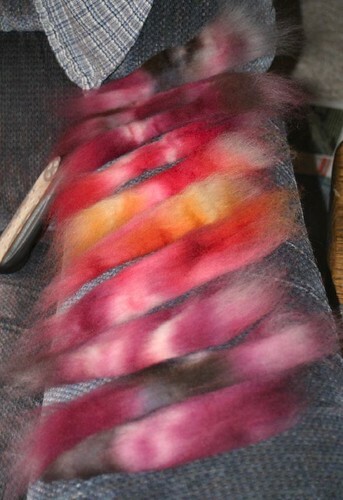 In the case of this fiber and in this prep — it’s one I’ve worked with plenty before, though not Pippi’s stylin’ dye job — I like to spin it from the ends of these tufts with a medium-length long draw, followed by a worsted-style slide and smooth with the forward hand. Kaylee was a huge help with this one. She’s learning to be a good spinner’s lap cat (that’s, a good lap cat for a spinner, not necessarily the lap cat of a good spinner, though I realize that’s verbally ambiguous). 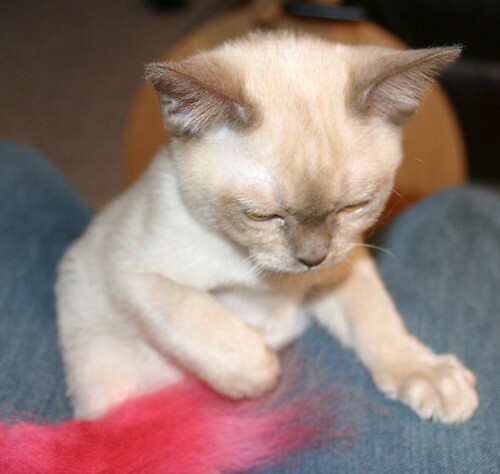 She is really drawn to red stuff. Eventually, she’ll be so used to me spinning she probably won’t grab for anything much… eventually. But just look how helpful she is. Okay, I admit it: there were a few places where I pulled off uneven colour spacing and spliced and then stuck in the odd bits. And there’s one splice in the skein where I left it overnight, yarn dangling between the lazy kate and the wheel, and the inevitable happened. You know, the inevitable thing when there’s a kitten in the house. Somewhere in one of the pink stretches, there’s a really serious splice. But I couldn’t find it skeining it, so it looks like my splice is fine. So here it is, drying on the rail of the deck on a shorts-weather afternoon… hey Pippi, if nothing else, your fiber got to go someplace nice and sunny! Oh, okay, you probably want to see it closer. 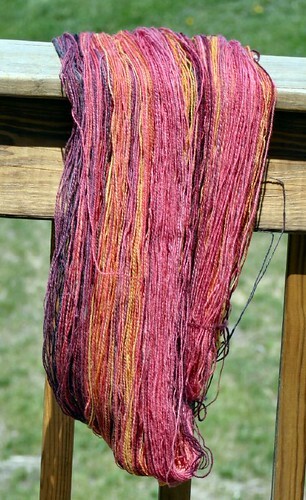 So here is the closer view of the yarn a-dryin’. And chances are you’re curious what the specs on it ended up being, eh? Well, Pippi knows the Falkland poofs — but then again, everyone else doesn’t. You can spin it really fine, and it’ll really puff up nicely. I didn’t spin this particularly fine, just played fast-and-loose idle spin-to-the-crimp with it, but as I mentioned above, with a worsted-style smoothing it down as I slide the forward hand back with a bit of extra twist. Loosely measured, it has ended up being 17 wpi. 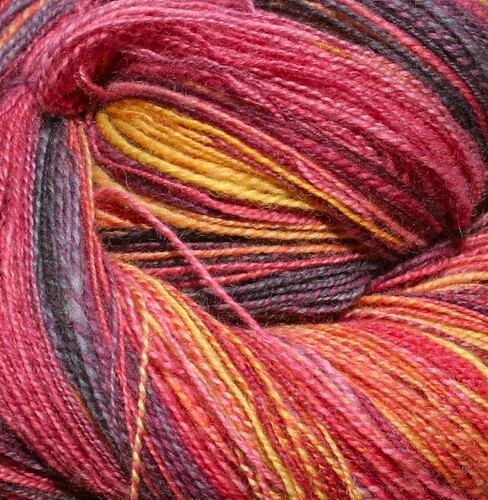 The skein is 605 yards long, and weighs in at 4.75 ounces or 134 grams. Pippi’s batches are heavy, and oh! Lest I forget! 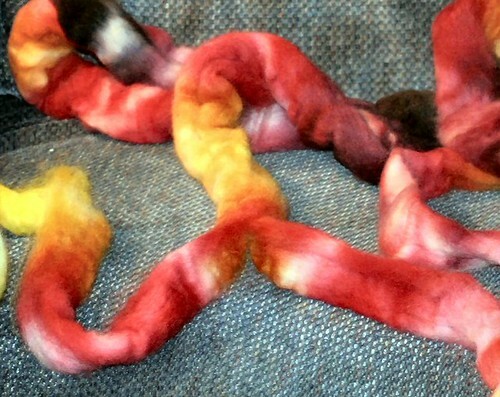 Her dye work is excellent; I always wash my handspun yarn brutally hot, and I often get a bit of dye release when doing so, but there was absolutely none here. This was a very satisfying, relaxing spin. And there’s enough non-pink, and the pinks are deep and dark enough, that there’s a strong likelihood of this turning into a quickie shawl of some sort. Kind of a big-needle lace project, maybe entrelac with lace blocks to play with the colour shifts. Something summery though, and wearable. 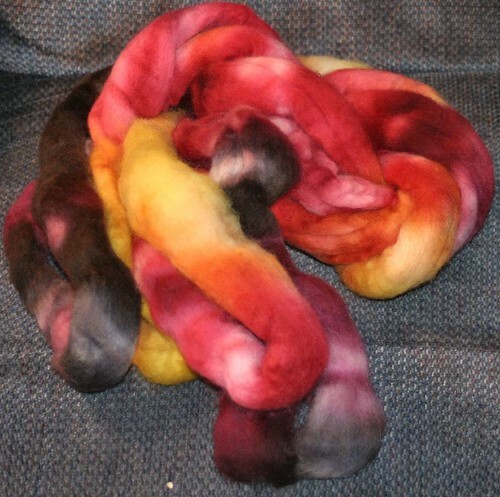 …and this’ll be a 2-ply alternating between the two colours pretty much at random. There’s the first bobbin done, and the second’ll be this evening I figure, and I’ll most likely ply it tomorrow on the Roberta. Then it’s back to that red optim, and after that, I’m gonna want to spin something fatter again. And maybe not red or orange. This entry was posted in Articles, Handspinning, Whatcha Doin'? by Abby Franquemont. Bookmark the permalink. Those are gorgeous colors. I love how you’ve spun them up. And you had a great helper. Reds & oranges = GOOD! And you must have sent the sunshine this-a-way! Abby, Thanks for such great pictures and the explanation for what you were doing and why. This post, like many of yours, has been very informative and one I am sure I will come back to. The yarn is beautiful. 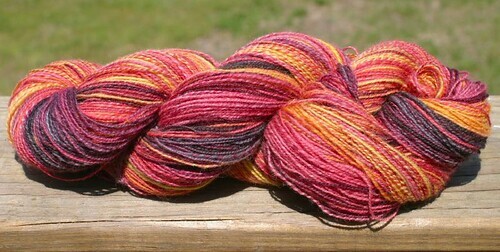 Very pretty yarn. I have a question about the Roberta. 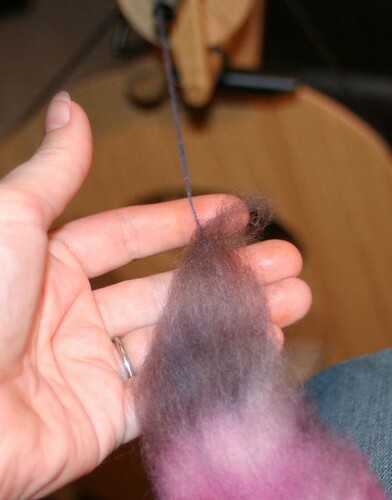 Do you spin with it or do you just use it for plying? How does it compare to spinning with a wheel? Which do you like better? oh! the reds and oranges make my heart go pitta-pat! thanks for sharing the breakdown of technique. I, too, am addicted to the Wasabi almonds. 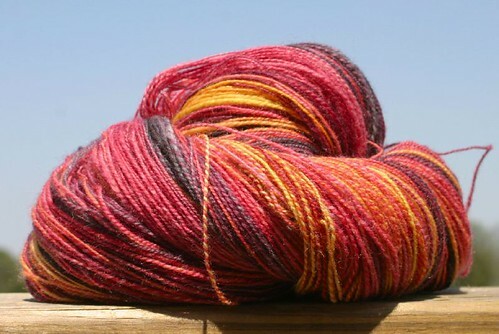 And the yarn is gorgeous. I can’t believe how well you got the colors to line up! Amazing! I wish Ohio was closer, I’d be your groupie! And those wasabi almonds? My absolute favorite. Wow, it looks wonderful, and what a cute little helper! I want to reiterate a comment from above about being helpful to a new spinner. So glad I found your site. And your kitten is just ridiculously adorable. That Pagoda fiber is *beautiful*, and your kitty helper is one of the cutest I’ve ever seen! 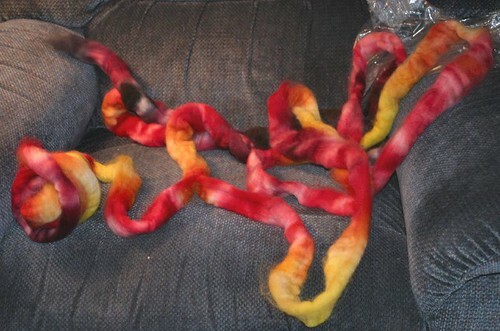 Thanks for the blow by blow… I’ve been afraid to delve into my dyed roving… and have been only spinning the fiber that I’ve processed myself.